There is a range of landscapes on Tocal. The regenerating landscape of rainforest and wetlands is interspersed with small areas of agricultural land. The natural vegetation contrasts with the 19th century European landscape around the lagoon where there are poplars and willows and other planted species on the knoll on which the Homestead is located. The area around the Homestead and including the College campus, consists of open grassland with scattered trees. More native species, including tall spotted gums, are being planted for shade but the area will remain open grazing land. The landscape of the College campus was a major source of inspiration for the prize-winning design by Philip Cox and Ian McKay in 1965. The College buildings were designed to fit into the hill-top to form part of the landscape with the Chapel as the centrepiece. The rest of the property is a rural landscape comprising a mixture of heavily timbered country, native/naturalised pasture, improved pasture and degraded improved pasture. The presence of the large lagoon was one of the deciding factors in the use of this area by both Aboriginal people and European settlers, as it provides a permanent source of fresh water for humans and animals. The proximity of the site to the river was also a factor in settlement by Europeans as the river remained a major transport route for 100 years. 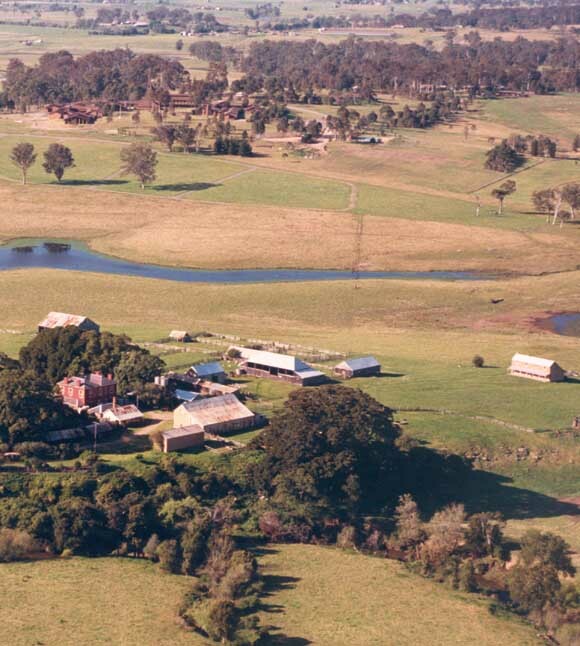 The fertile flats on the banks of Webbers Creek were cleared with convict labour in the 1820s and it is from this land that much of the wealth of Tocal was created. The area is now being restored, and over 60 species of local rainforest plants have been replanted since 1996. The low-lying area and wetlands at the back of the Homestead was one of the first areas to be cleared by Europeans for building materials, for the grazing of stock and to establish food crops. It had been an important resource for the Aboriginal inhabitants, who harvested plants and animals for use in daily life. The diverse ecosystems - from the rainforest along the river to the wetlands and the surrounding paperbark forest - provided a great variety of food and materials. The Homestead lagoons and wetlands are temporary homes to many water birds. Changing water levels provide a variety of habitats, giving an ever-changing spectacle throughout the year. Common birds on the Tocal lagoon include spoonbills, pelicans, wood ducks, moorhens, stilts, cormorants, ibis, herons, coots, egrets and the graceful black swans who arrive every now and then to raise a family. Europeans grazed their livestock in the wetland during drought and at one time, an attempt was made to drain the wetlands to make way for permanent grazing land. This had a detrimental effect on the wetlands and work is now underway to regenerate the natural ecosystem. The area has been fenced off to stock for a number of years and replanted with native species. Tocal is subject to regular flooding and the flats surrounding the Homestead may be covered by up to 4 metres of water. The Kidd family always kept one month’s food supplies on hand as the property could be isolated by flood waters. Floods have a huge impact on the operation of the property as they make large areas unusable and hinder stock movement. The establishment of the railway line in 1911 caused further dislocation to the operation of the property, even more so than the irregular occurrence of floods. While floods cause great inconvenience to farm operations, the sediment left behind as the floodwaters recede has been vital to the fertility of these flats.